The quarterbacks when No. 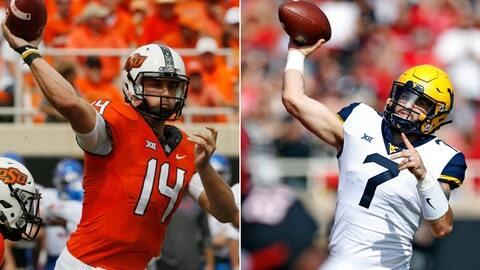 7 West Virginia (8-1, 6-1) plays at Oklahoma State (5-5, 2-5). WVU’s Will Grier, the Heisman Trophy contender, has thrown for 329 yards a game with 31 TDs. Taylor Cornelius, OSU’s fifth-year senior and first-time starter, has thrown for 312 yards per game with 23 touchdowns. Cornelius does have to throw against a Mountaineers defense has allowed only 233 yards passing a game and a league-low 13 TD passes. Grier has 1,042 yards passing with nine TDs and one interception in three games since only 100 yards in a loss at Iowa State.